USB Microwave Concept Still Falls Short | OhGizmo! As you can imagine, I spend a lot of time at my desk. So much in fact, that there is a mini fridge withing rolling distance of my chair. It’s nice to be able to grab a drink without breaking my flow of concentration. Of course prepping some food still means going downstairs and taking care of it. What I want is something I can set on my desk that will warm up my food. 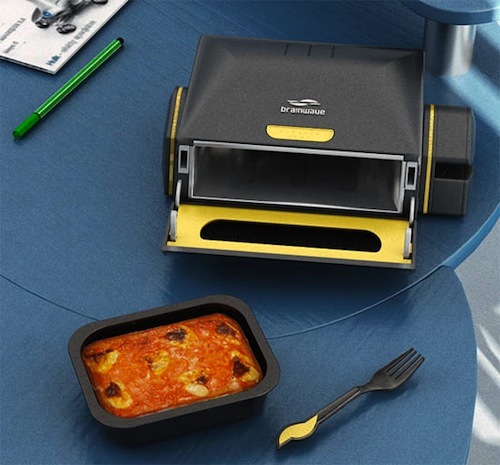 Here is yet another desktop microwave concept. Why are there so many concepts without an actual product being on the shelves? It’s like the designers enjoy teasing us. Anywho, this one is also USB-powered (which makes me wonder at its effectiveness) and only appears to heat up special meals. Sure, the means would come with a RFID-equipped plastic utensil that programmed the time into the microwave, but it won’t cook my Spaghetti-o’s. Is that really too much to ask?